Each quarter the Office of the Comptroller of the Currency (OCC) releases a detailed report showing the exposure to derivatives at U.S. banks. The most recent report for the quarter ending June 30, 2016 indicates that U.S. bank holding companies have a total notional amount (face amount) of derivatives of $252.6 trillion. Of that total, just five Wall Street banks hold $230 trillion or 91 percent, underscoring how massively concentrated this high risk game has become. Those five banks are: Citigroup, JPMorgan Chase, Goldman Sachs Group, Bank of America and Morgan Stanley. There are numerous U.S. units of foreign banks on the derivatives list of bank holding companies but one name is conspicuously missing: the German giant, Deutsche Bank. 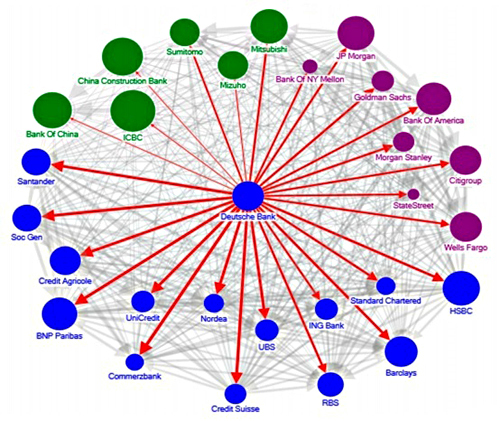 Without knowing how much potential exposure U.S. banks have to Deutsche Bank in the derivatives arena, the U.S. public is left completely in the dark on just how dangerously exposed our banks are, once again, to the potential failure of a systemically interconnected counterparty. Here’s what we do know – no thanks to the OCC’s copious reports. Since October, Deutsche Bank has recovered some lost ground, closing yesterday on the New York Stock Exchange at $18.37. That trading price, unfortunately, still puts it at a share price loss of 86 percent over the past decade. The report includes the graph below, indicating that a blowup at Deutsche Bank would spill out to every major Wall Street bank — banks which are holding almost half of the insured savings deposits in the U.S. – effectively mandating more massive taxpayer bailouts such as those that occurred in 2008. If all of this wasn’t concerning enough, the very type of derivatives that blew up the giant insurer AIG in 2008 (credit derivatives) are making a big comeback at Citigroup, the recipient of the largest taxpayer bailout of a bank in U.S. history during the 2008 crash. 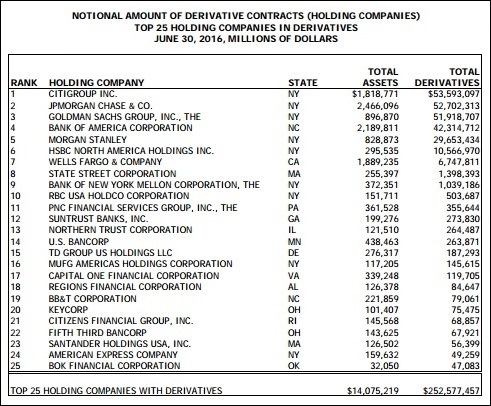 The OCC’s June 30 report shows Citigroup’s holding company with $2.2 trillion in credit derivatives and $53.6 trillion in total notional amount of derivatives — at a bank holding company with only $1.8 trillion in assets. That statement would clearly be more reassuring to Americans had not the largest bank in the U.S. in 2008, Citigroup, blown itself up while lying to the public and its shareholders about its exposure to subprime debt and holding more than $1 trillion in assets off its balance sheet. The OCC’s reassurance would also be more believable had JPMorgan Chase not lost more than $6.2 billion of its depositors’ money gambling in high risk derivatives in London in 2012 – just four years after the biggest financial crash since the Great Depression and just two years after the Dodd-Frank financial reform legislation was supposed to have restored sanity to the U.S. banking system. The OCC urgently needs to defog its lenses and defang the derivative entanglements at the biggest Wall Street banks.